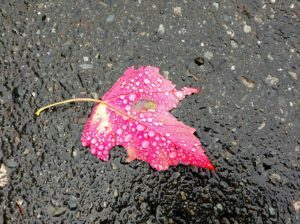 Soon after the recent Wisdom School with Cynthia Bourgeault, retreat participant Jennifer England (Integral Master CoachTM with sparkcoaching.ca) wrote a piece reflecting on Omega, Teilhard de Chardin, the process of evolution, and love. Heather Page, president of The Contemplative Society, provides the introduction, a Thanksgiving letter, also inspired by the Wisdom School. Canadian Thanksgiving will be celebrated this weekend. As many gather around the table to celebrate family and abundance I am reminded of a passage Cynthia referred to in her recent Teilhard Wisdom School here on Vancouver Island. Cynthia reminded us that the force of love cannot be contained in one person; we need to bear the beams of love together. She used the illustration of a choir as an example of how every voice is necessary for the expression of the whole. Each individual brings a distinct quality adding to the magnificence of the combined expression. Jennifer England attended this recent Wisdom School and I have included her beautiful reflection below. In her own authentic and distinct voice, Jennifer captures a unique expression of the Wisdom week. As we celebrate Thanksgiving, or simply pause in gratitude, may we sense the wondrous ways we are connected to a larger body of family, friends, and colleagues as well as to all of creation. I am particularly grateful at this time of year for the body of contemplatives who share, as Jennifer writes, the yearning “to become intimate with the active force of love”. 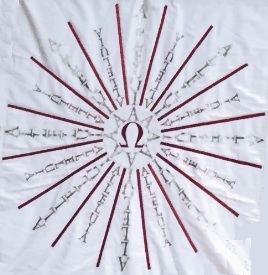 On all our ski trips, Dad drew the Omega symbol in a snow bank with one of his poles every time we stopped. There were so many, you could have found your way home just by following the symbols. He drew it in every birthday card, Easter Sunday drawing, and I’m sure on our country mailbox and my first bottle of scotch. Whether it was embellished with eyes, a pointy nose, and a half smile, it has been with me since I was a young girl. Even though I knew I should read before Wisdom School, I was reluctant to delve into my $1.95 copy of The Phenomenon of Man by Teilhard de Chardin.¹ I had his work jostling for room on my nightstand, but couldn’t get into it late at night – it felt too intellectual and heady. But on the first night of the retreat, Cynthia helped me find a way in. Wisdom School, she pointed out, is not about downloading information but about wisdom formation. Knowing with more of you. As the first night descended, we gathered with our sheepskins, meditation quilts, journals, and mugs of tea. 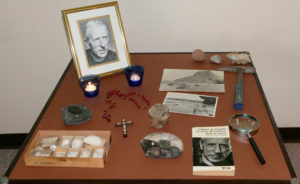 A framed photo of the Teilhard, the French scientist/Jesuit priest, was nestled among lit candles, rocks, and fossils on a nearby table. And we, of all ages, were ready to find our way to the Omega. 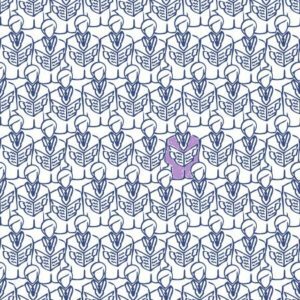 Whether it is through our awkward groping in the dark or the constriction that comes with too many people in a limited space, evolution works because it’s under tension. As long as things have their own space, there is not motivation or impetus for change. From here, Cynthia took us through Teilhard’s ideas on convergence – whereby humans are the “axis and arrow of evolution”. Like lines on the globe merging at its poles, so too is the direction and pulse of transformation. So, as the planet becomes dense with humans and space and resources become limited, we naturally experience increasing tension. For me as a hopeful humanist, I’d like a bit more space and less stress on our globe, but for Teilhard, he saw this as a good thing and would have loved densification of neighbourhoods and sweaty subways. And this is where I began to really pay attention with Teilhard. Because, if you are a bit like me, and have felt fear listening to the news – whether on Syria or US politics, it’s easy to feel discouraged as to where we’re collectively headed. But for Teilhard, our dissonance and difference is where unity begins. With friction between the parts of a system, we experience more exchange, connection – enabling the radically personal to emerge, those deep and vulnerable places of being human when faced with anguish, grief, uprootedness. What is it on behalf of? Intentional design or sentimental hope? Resurrecting a deeper quality, Cynthia reminds us it’s the drive shaft of love wanting to become revealed and known in the granular, the personal, and the messiness of everyday human life. And this active force of love is the undercurrent of it all…leading us to a collective experience of increasing interiority, where all things are joined. This is the Omega. And, Teilhard quietly says in the Epilogue of The Phenonemon of Man, the Cosmic Christ. Simply, as I understand it, the incarnation of Jesus in human form – where the movement of Divine love became holographically part of this planet. How to know more of this, with more of me? The Other Way to Listen by Byrd Byron is one of my favourite stories to read to my kids. It’s about a young boy and an old man who talk about what they can hear. The Old Man says he can hear a cactus flower bloom in the desert. The boy wants to learn. The Old Man tells him he has to learn another way to listen. Only then will the rock speak. The lizard howl. The cactus sing. I am groping my way to listen differently. And this is the wisdom formation that Cynthia talks about. The path of wisdom is to become intimate with the active force of love within that yearns to be known and related to the yearning in another. At the retreat, I was staring up at the millions of fir needles in an old growth forest, watching raindrops fall from hundreds of feet up. In that moment, I remembered the Omega in the snow. All of the Omegas. Hundreds of them carved into the frozen water, sliding over billions of years of layered bedrock. Jennifer is an Integral Coach who lives in the Yukon with her family. She was one of the 50 people, and one of the youngest contemplatives, who attended this year’s Wisdom School. Read more about her on sparkcoaching.ca. Cynthia Bourgeault recommended the following translation for our Wisdom School: Teilhard de Chardin, Pierre. The Human Phenomenon. ed. Sarah Appleton-Weber. Sussex Academic Press: 2003. This is a re-post of an article written for Northeast Wisdom by Sher Sacks on December 21, 2015. Shortly after Matthew spent time with us at Shawnigan Lake, BC, he hosted a similar retreat in Sechelt, BC. On November 23 and 24, 2015, Matthew Wright, an Episcopal priest from St. Gregory’s church in Woodstock, NY (yes that Woodstock) presented a group of about two dozen with a remarkable range of material about the Wisdom teachings of Yeshua (the Hebrew name of Jesus). We have long been taught what we are to believe about Yeshua but far less about how the teachings of Yeshua can transform our lives. And Matthew offered this option. The workshop was not about knowing more, but about knowing more deeply. We are often told to “get out of our heads and into our hearts” which is problematic given the nature of the English language which equates heart with emotion. As Matthew pointed out, the heart is not the emotional centre, it is rather the organ of spiritual perception. It would be more accurate to say “get into your HeartMind”. This understanding makes Yeshua’s phrase “Blessed are the pure in heart, for they shall see God” (become conscious of God), make more sense. Matthew spent some time discussing what is now being referred to as the second axial age. The first axial age occurred around 800 to 200 BCE, when there was an enormous increase of spiritual understanding. It was the period in which the Buddha taught, Lao-Tzu (the founder of Taoism) was teaching in China , the Rishis (writers of the Vedas) were active in India, and Monotheism arose in Israel (Abraham and Sarah left their tribe to “follow God” and the Abrahamic covenant was born). Out of this incredible upwelling of spiritual awareness came a sense of transcendence and an individual quest for spiritual understanding or enlightenment. The ultimate goal became escape, or liberation from the world of matter, which was considered lesser or even evil. The problem became one of how to escape from samsara (cycle of rebirth in Hinduism, Buddhism, and Taoism) or to repair the rift created by “the Fall” (Christianity). The end result was the sense that something was wrong with this world. Our spiritual consciousness became dominated by images of separation and exile. However, slowly, over the centuries, according to many thinkers, including Matthew, there has risen the deep indwelling knowledge that “we belong”. We have begun to pick up the very real connection with the earth and each other that existed in pre-axial times. This sense combined with the first axial age sense of transcendence, gives us the opportunity to move into a synthesis of the transcendent and the immanent to create a new world order. During the workshop Matthew pointed out that multiple strands of knowledge point us in this direction. Quantum physicists have discovered the deep interconnection of all things at the most subtle levels of matter; environmentalists are pointing out that we are part of a global ecosystem; evolutionary biologists, reveal that life is unfolding as a vast, single process. Matthew also pointed out that this “second axial current” didn’t just start recently. It is present in the Bodhisattva vow of Mahayana Buddhism (the vow to remain in the phenomenal world until all beings are awakened) and in Incarnational theology (elimination of the boundaries between the sacred and the profane – “God so loved the world” and “the Word became flesh”). Yeshua rejected the asceticism of John the Baptizer and pointed us to a path that fully embraces the world. He partied, feasted, and associated with those identified as outcasts and sinners. He broke the purity laws. Yeshua prayed “Thy Kingdom come on Earth”. His teaching indicated that we belong deeply to this world; we are interwoven into its fabric. As a teacher within the Wisdom tradition of the east, Yeshua taught us about compassionate, loving intelligence where attention (alertness, spaciousness) and surrender (a humble letting go) meet in the heartmind. It is not so much about what Yeshua taught but about where he taught from. What he taught was not a moralistic, but a transformative path. Matthew spent some time describing the reasons why this basic teaching of Yeshua morphed into the moralistic, judgmental teaching within which most of us were raised. He followed the growth of Christianity out of its eastern foundations toward Greece and Rome, with martyrdom leading to “we/they” thinking, and finally to the moment that Christianity became an imperial identity marker within the Roman Empire with its counsels of Bishops. What one believed became all important and led to the inquisition, witch trials, and the crusades. Yeshua’s path of inner transformation was almost lost. Now we have the opportunity to move beyond a belief and belonging system to the recognition of Yeshua as the archetype of the full union of human and divine – Christ consciousness. Yeshua is not the exclusive union BUT the fullness of the human and divine union (Christ). In reference to this concept we discussed some of the Christian and Sufi mystics and their practices, kataphatic prayer (prayer with content), and apophatic prayer (emptying the mind of words and ideas and simply resting in the presence of God). We discussed how we can learn from each other using homeomorphic equivalency, looking for deep correspondences that go beyond the words and concepts of our distinct religions or cultures to find the same or similar experiences. We also considered the phrase “the Kingdom of God” not as a place (Heaven) or existing at a particular time (after death), but as a state of consciousness, here and NOW. We turned our minds to Christophany (all reality as a manifestation of Christ) and reflected upon Raimon Panikkar’s concept that reality is Cosmotheandric (a totally integrated and seamless fabric that is the undivided consciousness of the totality). We examined Teilhard de Chardin’s concept of Christogenesis, within which Christianity is not a path of ascent but a path flowing out from God. Matter is not a distraction from God but an outworking of God in form. Incarnation awakens to itself in Christ (Form). The world is not static but constantly changing. God is committed to that change, since as the creator God embedded it in the world and now sustains it. Christ consciousness is its goal. As Paul stated in Romans 8:22, “We know that the whole creation has been groaning as in the pains of childbirth right up to the present time”. concept of axial ages we noted the rise in non-dual consciousness. We noted that evolution has been acting unconsciously up till the present but now we have the opportunity to act consciously in it. Evolution has become aware of itself. We must choose to deepen the disclosure of the Heart of God. Christ is the endpoint (the Omega). However this convergence is not inevitable. If the second axial age is to manifest we must choose and act!